The Sweetness of Salt by Cecilia Galante. Grades 7 and up. Bloomsbury USA, November 2010. 320 pages. Reviewed from ARC scooped up at BEA. Julia's doing everything right. She's just graduated valedictorian of her high school class. She's landed an internship in a law office for the summer and in the fall she's off to college to start her pre-law studies (she's got a full ride to Pitt). Then it'll be law school... but is studying law Julia's dream or is she just following in her father's footsteps? When Julia's older sister Sophie comes home for her graduation, she reveals a family secret that changes everything. Suddenly Julia's not sure what she wants or who she can trust. So Julia heads to Vermont to spend the summer with her sister, helping her renovate an old house into a bakery and, hopefully, getting some answers to her questions. Over the course of the summer Julia will get to know her sister and she'll realize that you have to take the salty along with the sweet. I enjoyed this book and it reminded me most of Sarah Dessen (whom I love, so that's a compliment!). What I liked best was the journey that Julia undergoes. She's lived this sheltered life, never a toe out of line, aiming for the goal she thinks she should have. Now that everything's changed, Julia has to figure out what she wants and how to go after it. The change comes about gradually and in a totally believable way. There are a handful of those small-town quirky characters, who I found somewhat interchangeable with the notable exception of Aiden - a dreamy older artist that Julia starts talking to. And there's a little superfluous romance, but it's not the main focus of the book. It's a book about sisters and family. It's a book about figuring out who you are. It's a book about a time in your life when things start to change and you'll never be the same. I think Julia's journey will resonate with many teens who are teetering on the precipice of adulthood. 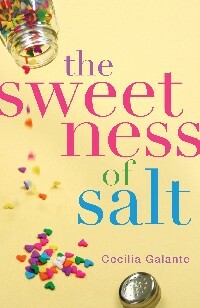 The Sweetness of Salt will be on shelves November 9.